NASMM's Circle of Service designation recognizes members who have attained an elevated level of experience and expertise. 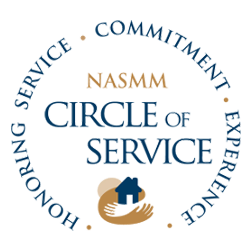 The Circle of Service is awarded to NASMM veteran members who are in good standing for a minimum of five years and have shown consistent dedication and support of the National Association of Senior Move Managers and the Senior Move Management profession. 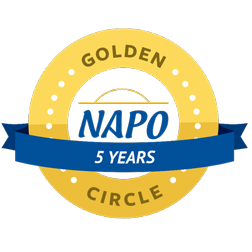 The Golden Circle of NAPO represents the essence of the NAPO mission: to be the leading source for organizing and productivity professionals by providing exceptional education, enhancing business connections, advancing industry research, and increasing public awareness. Debbie Ginsberg is a committed business person who values education, professional development, and staying current on trends and advancements in the industry. It signals that Mrs. Ginsberg has aligned herself with an established and esteemed association that leads and advances the organizing and productivity profession.